Earlier this year, the city of Las Vegas hosted the Consumer Electronics Show (CES), which is the annual event where many of the greatest upcoming products and technologies in the consumer electronics industry are unveiled and showcased. Here are five home trends that will impact the American home in the near future. Recent advances in artificial intelligence (AI) are enabling some seriously smart cameras. One of the best examples at CES 2019 was an app called Smoke Detective, which turns indoor camera-enabled devices—like smartphones and baby monitors—into smoke detectors. The app uses AI-enhanced algorithms to detect smoke even sooner than conventional smoke detectors. If it lives up to reports and expectations, this app could help prevent billions of dollars in property damage. Other upcoming AI-enabled camera technologies to take note of include “smart imaging” and “food recognition,” which, respectively, allows cameras to recognize specific people and enables ovens to set cooking times and temperatures for specific dishes. Nearly thirty percent of Americans have experienced package theft, according to an industry report. While video doorbells help catch so-called “porch pirates” in the act, a new partnership between Amazon and Chamberlain Group, a manufacturer of automatic garage door openers, offers an even more promising solution: in garage-delivery, known as Key for Garage. Amazon currently offers in-home delivery, but many homeowners are wary of allowing delivery persons into their homes for this service. With Key for Garage, you install a device to your garage door opener that allows the delivery person access to your garage and notifies you along the way. “The kitchen is the heart of the home”—we’ve all heard it and lived it. 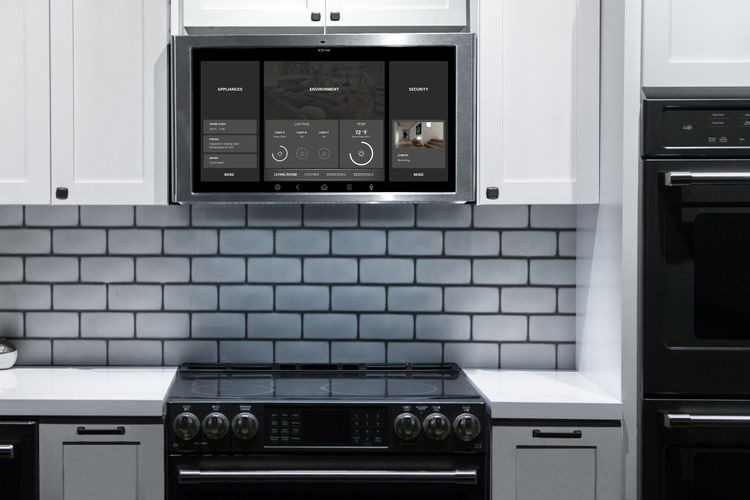 While serving as the heart, kitchens are also poised to become the brains of the home as our homes become ever-more-connected and need a centralized control hub. And some companies are coming through with solutions for this. For example, GE’s new Kitchen Hub is an over-the-range vent hood with a 27-inch smart touch screen that serves as the home’s central control center. It allows users to search the internet, create shopping lists, and access thousands of recipes. It also has live video chat functionality and an overhead cooktop-facing camera for checking dishes while they cook. And with it, you can control other connected devices in the home, such as your thermostat, lights, and door lock. As green, sustainable living comes ever-more to the forefront of discussion overall, indoor air quality has become one of the next big targets of smart home tech. One system that is already building a solution is Aura Air, an all-in-one air purification system, which starts by monitoring the air in your home for things like smoke, allergens, and volatile organic compounds (VOCs). It then uses a five-stage purification process to remove those toxins. As it monitors, the onboard voice assistant also alerts you to serious issues—such as carbon monoxide—and gives instructions on what to do. 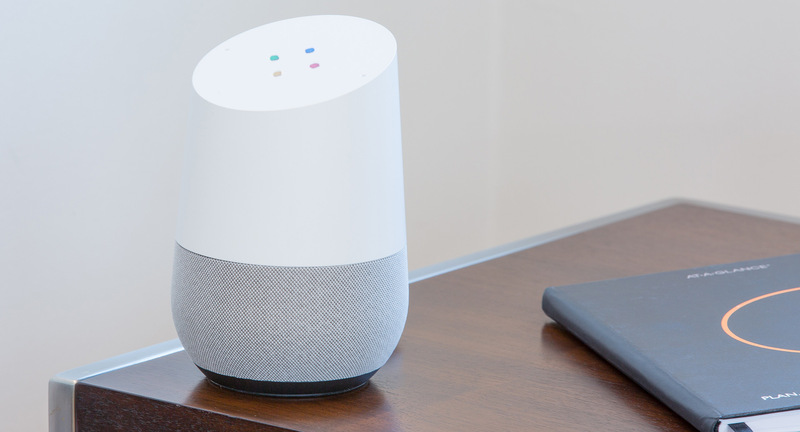 “OK Google, turn the lights down low.” Further advances in smart lighting make it easier than ever to install, and homeowners can now even set different modes in the home by voice (e.g. cleaning, entertaining, sleeping). Taking it one step further, GE lighting’s latest line of smart bulbs, C by GE, eliminates the need for an extra hub and operates via Google Assistant, by allowing consumers to simply screw in a lightbulb and wait for it to appear in the Google Home app, which even allows you to control the lights by voice. C by GE “smart switches” also allow you to bring the same seamless experience to existing bulbs in your home. All these smart home trends seem to be geared towards making our lives simpler and more efficient. And the widespread adoption of these innovative technologies may start to become more of a necessity than a luxury for many of today’s homebuyers—particularly for the younger cohort of buyers, as millennials become an ever-growing segment of the real estate marketplace.